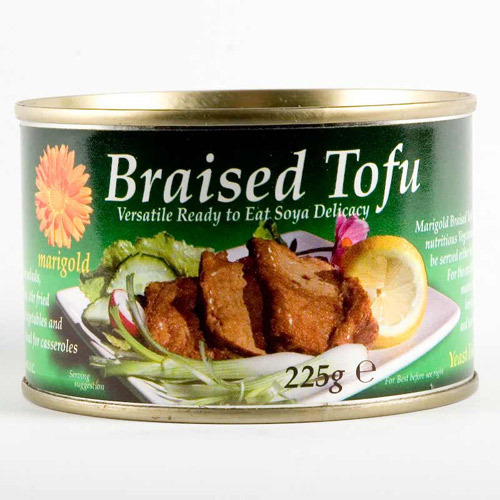 Delicious in salads, sandwiches, stir fried with vegetables and ideal for casseroles. For the exciting flavour of the sea try it mashed with flaked toasted nori, lemon juice, chopped spring onions and sea salt. Nutritional Information per 100g: Energy 1033kJ/247kcal, Protein 13.4g, Carbohydrates 6.7g (of which sugars 3.8g), Fat 18.5g (of which saturates 16.5g), Fibre 0.1g, Sodium 0.5g. Dairy Free, Egg Free, Lactose Free, Vegan. Dried soyabean curd (85%0, Water, Sunflower oil, soyabean extract, Millet extract, Sea salt. The Marigold Braised Tofu - 225g product ethics are indicated below. To learn more about these product ethics and to see related products, follow the links below. I love tofu in all forms but I couldn’t stomach this. It has a very strong aroma that permeates the entire dish which lingers even after picking it all out. Excellent and versatile product. Can be used in lots of different recipes, it lots of different ways. My dogs enjoy it as well, as a treat. Lovely tofu, I buy this a lot. Versatile ingredient for stir fries. There are currently no questions to display about Marigold Braised Tofu - 225g. You won’t catch a whiff of rubbery yellow gloves here , but you will find the finest bouillon cubes available, with recommendations from the likes of Delia Smith and Nigella Lawson. Made using only the highest quality ingredients of vegetables, herbs and spices (and with absolutely no preservatives, artificial flavourings, colourings, emulsifiers or stabilizers), Marigold bouillon cubes deliver a rich clean taste.